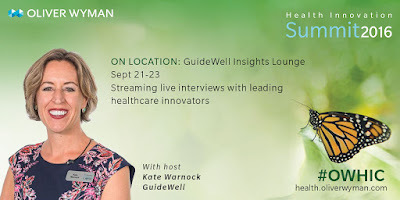 On day one, my friend Kate Warnock – Social Media Manager at GuideWell Health - was at the summit interviewing key individuals at the GuideWell Insights Lounge. This is the 2nd year that the GuideWell Insights Lounge has stationed itself at the OW Summit; the GW Insights Lounge is apparently a new fixture at major healthcare conferences. 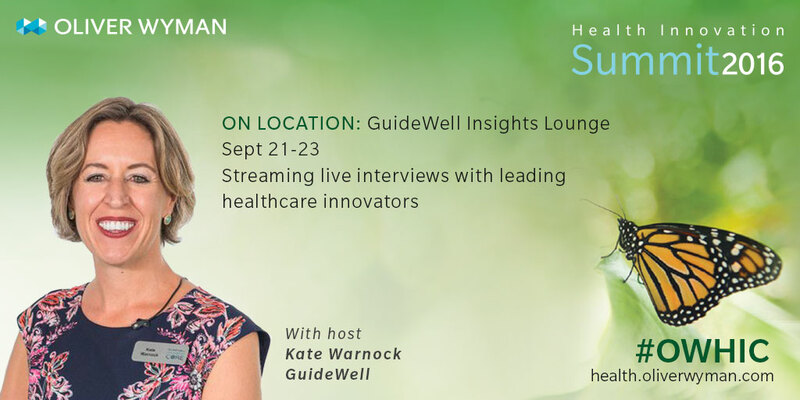 I gotta say I like how Kate and GuideWell capture, curate and share valuable information about healthcare innovation, thought leadership and trends. One of Kate’s first interviews of the event was with Terry Stone - Global Managing Partner for the Health and Life Sciences Practice - at Oliver Wyman. Terry shared with Kate some insight into the difficulty healthcare payers are having with their transition from a business-to-business (B2B) to a business-to-consumer (B2C) business model. Terry also shared how innovators must understand the entire healthcare ecosystem and outlined the 'category' of those who might be in the best position to really disrupt the health market. The following is a transcription I pulled off of the YouTube recording created by the GuideWell Insights Lounge. You can see the entire interview here. You may also want to check out tweets from the summit tagged with #OWHIC. We've been talking about the consumer in the health industry for a long time yet we still seem to lag behind behind other industries. Why is that and what can we do to fix it now? "That's a great question. I think in the last three years, in some way shape or form, we've touched on this each year: about where are we and why are we kind of stuck? That actually is a key part of why we focused the conference on what we have this year. Because healthcare does seem to be a little bit stuck. And I think it's a great question. We've given a lot of thought to it. I'll start by the first, most basic premise being: healthcare has always been a B2B industry versus a real business-to-consumer industry. So in B2B businesses, health plans were selling to large employers. Right? Quite frankly, provider systems were negotiating with health plans and quite frankly the consumer, in some ways, was an afterthought. Okay. But that sounds a little overly simplistic. Like okay. So it's B2B now we have to be B2C. But I think it's really important that people understand what happens when you're in B2B market versus B2C and why does that make it so difficult to change? “So first of all, in a business-to-business market, your buyers are often buying for a lot more like rational logical reasons. You also have very sophisticated buyers buying a complicated service and, in some ways unintentionally I would argue, the product gets more complicated as each side tries to prove to one another that they're adding more value. Right? It's almost the antithesis of what you need for the consumer and that's a really hard paradigm to break and that actually is most pervasive through most of healthcare. How important is it for organizations to really understand the full ecosystem and to be able to connect the dots - another theme here at the summit? “Sure I'm we talked a lot about the ecosystem and healthcare and it's funny we talk about the healthcare system in the US and I think what someone said it great ones where they commented that we don't have a system what we have is a bunch of parts and pieces that are all stuck together and you get this sort of random ecosystem, if you will." Who do you think is in the best position to really disrupt the health market? “It’s sort of the 10 million dollar question. I think if I knew specifically I probably wouldn't be sitting here and I'd be betting my money on someone else. But I will speak kind of categorically that, in my role, I see lots of players in healthcare. I cut across payers, providers, life science companies, health services and tech innovators. And what I have kind of strongly come to believe is that most likely the disruption that really changes things going to come from the outside." "So that healthcare is in some capacity going to be airBNB’d or uber-ized. And by that I don't mean ‘Uber for Health,’ I mean somebody out of left field takes an industry that's kind of not delighting the stakeholders and has excess waste and it's going to kind of disrupt it and shake it out. And that could be in the form of the Apple’s or the Google’s of the world. Right? It could be the Walmart’s of the world. You know that the average Walmart consumer, I believe, goes in more than twice a week, over a hundred times a year. What do you hope is achieved at this year’s summit? “So what we're hoping to achieve this year is going beyond the basic part of innovation; which is ‘Oh, what's that company do? Or what's that technology? Or that seems really neat. And actually what we've been striving to do for the last couple years is get underneath “what's the magic in what makes that company special? What is it that makes it stick? Why are consumers delighted? And how did we get beyond the basics of the functions and the features and figure out what it is that really makes it sing and what really makes it kind of win. And I think that's a lot of what will be sharing." Check back for more insight on healthcare data, technology and services. And consider following me on Twitter.